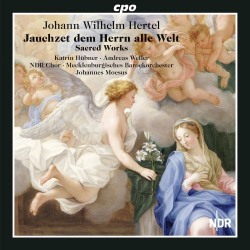 The CPO label is serving Johann Wilhelm Hertel well, and this admirable programme of Sacred Works follows on from a fine recording of his cantata Die Geburt Jesu Christi (review). Hertel’s education followed in a line traceable to J.S. Bach, and with a large dose of orchestral experience via the instruction of Franz Benda, as a violinist Hertel also performed with and was known to the flute-playing King Frederick II and the likes of C.P.E. Bach. This programme begins with a work from later in Hertel’s career, the Cantata on Psalm 100, with festive trumpets and timpani adding colour and an emphatic edge to the orchestral sound, reflecting the celebratory nature of the occasion for which the piece was composed, the sixty-third birthday of Duke Friederich, the ruling prince of Mecklenburg and its environs. There are also some striking quiet moments and sinuous chord progressions, adding up to a very fine work indeed. All texts are given in German and English in the booklet, which has instructive notes from Stefan Fischer. The Sinfonia which follows is another piece with a feeling of celebration, with trumpet trills and considerable support from the horns. The central movement of the three is a charmingly lyrical duet for two flutes over strings. The Choral Cantata “Ich ruf zu dir, Herr Jesu Christ” takes us into a different world with its slow, expressive opening. The association of each of these works with particular chorales is the result of Duke Friederich’s idea of a unique form of music intended to “instruct and strengthen his subjects in the pietistic faith”. This is certainly heard at its strongest in this particular cantata, with Hertel bringing out plenty of compositional tricks to tug at the heartstrings: descending lines, sighing harmonies and melodic shapes, and gently transparent orchestration. Solos are nicely performed by both soprano Katrin Hübner and tenor Andreas Weller. Right up to the at times achingly beautiful final choral movement this work certainly holds the beating emotional heart of this programme. If the Choral Cantatas can be said to be more forward-looking, the two Motets hark back more to standard settings for liturgical use. Their simple clarity, with a light organ accompaniment and some nice expressive touches enhancing the text, make for a pleasant if unchallenging intermezzo to precede the final Peace Music. This was also written for religious use as a thanksgiving after the conclusion of the Seven Years’ War. Framed by stately processional music with a central orchestral Allegro maestoso and a final optimistic Allegro, this work sets two chorales in praise of God. The words are ornamented with obbligato instrumental parts which weave around the simple melodies in a not always entirely convincing fashion. It's like a church service which has been crashed by a folk-fiddler bored by ecclesiastical four-squaredness. Altogether this is another superbly performed selection of music by one of the eighteenth century's less well-known composers, and as such can be welcomed wholeheartedly. With moments of genuine beauty and a general feel of festive celebration this is more than likely to put you in a very good mood indeed.